A subglacial ice plume is a body of ice injected from bedrock into the base of a cold glacier by a combination of artesian groundwater, hydraulic action and ice segregation. 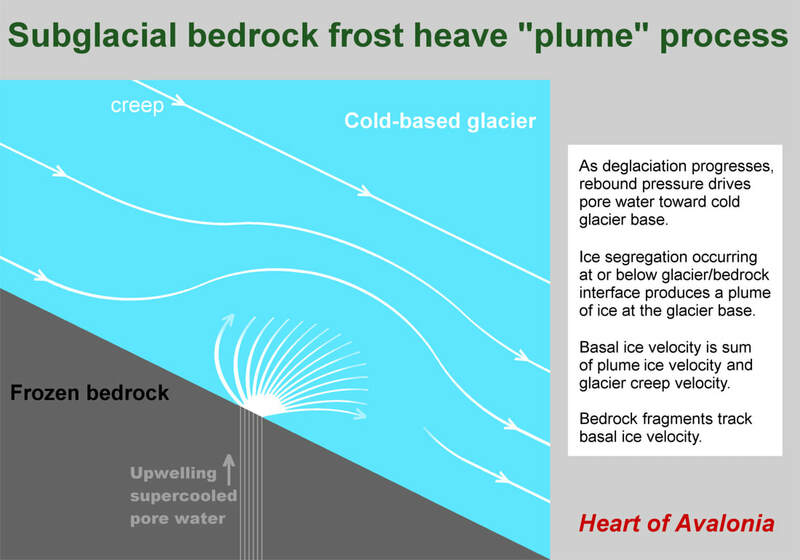 Patterns observed in ice-disrupted bedrock can reveal the past existence of subglacial ice plumes. The above photo shows a bedrock frost heave occurrence on the Isthmus of Avalon. The bedrock is ignimbrite that was metasomatized (hydrated, yielding phyllosilicates) and later subjected to low grade regional metamorphism that induced foliation. The prominent inward-facing flat surfaces of the frost-heaved joint blocks follow longitudinal tectonic cleavage. The feature occurs in an area demonstrating an abundance of large frost-heaved bedrock monoliths. The local area also shows convincing evidence that bedrock frost heave has occurred in a subglacial environment. The above-illustrated feature incorporates three large joint blocks that have been pushed upward and tilted outward to create the open space seen at the center. It is possible that the diverging tilt angles are the chance result of settling after glacial ice melted. However, it is also possible that the tilt angles are the direct result of alignment of the blocks by ice creep. 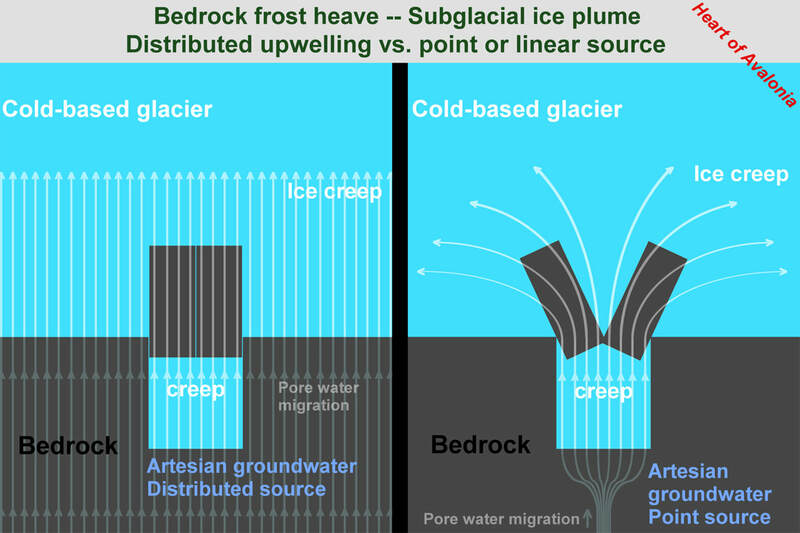 This second explanation leads to the interpretation that the above-illustrated bedrock frost heave feature was formed by a subglacial ice plume. Many features suggesting subglacial-ice-plume action have been observed on the Avalon Peninsula. The most easily recognized features usually include a grouping of ordered frost-heaved bedrock fragments that appear to align in a manner indicating flow. The indicated flow directions sometimes imply diverging ice flow, as would be expected if the ice causing the frost heave was emerging from a localized source and then spreading outward and upward into an overlying glacier. Sometimes however, unidirectional non-diverging flow is indicated instead. Other types of ice-disrupted bedrock occurrences, not showing clear evidence of alignment by ice flow can also represent instances of subglacial ice plume activity. These instances, although harder to characterize unambiguously, may nevertheless fit well within the context of the subglacial ice plume model and can be used to support and develop the model. The diagram below illustrates the subglacial-ice-plume model. The subglacial ice plume model illustrated above is closely associated with the Subglacial Ice Segregation/Cold Deglaciation model described in Technical Note 11. The present discussion builds on the SIS/CD model, concentrating specifically on subglacial ice plume action and the type of ice-disrupted bedrock features that subglacial ice plumes can generate. Based on the observations of ice-disrupted bedrock that have been compiled to date (February, 2018) within the Heart of Avalonia Frost-heaved Bedrock project, it appears reasonable to interpret most of the ice-disrupted bedrock features observed on the Isthmus of Avalon and on the Carbonear sub-peninsula as relict subglacial ice-plume features. 01) Bedrock was rendered water-permeable by regional metamorphism, resultant foliation of the bedrock, and then, during the Quaternary, by repeated loading and unloading by thick glacial ice. 02) Groundwater was driven deep into subglacial bedrock by hydrostatic pressure beneath thick, warm-based glacial ice cover that overlay the region during the Wisconsin glacial stage. 03) After the last glacial maximum, ice thicknesses over the Avalon Peninsula began to decline. As long as glaciers remained warm-based, declining glacial ice thickness (hence declining basal hydrostatic pressure) caused groundwater to migrate toward the bedrock/glacier interface where water could leak out without causing bedrock disruption. 04) During the Younger Dryas cold interval, a freezing front was pushed downward through the remaining thickness of glacial ice cover in some areas, reaching and penetrating subglacial bedrock. 05) As the Younger Dryas progressed, glaciers became cold-based in the areas now showing major bedrock frost heave and related bedrock disruption. In these areas, glacial flow transitioned from a combination of creep and basal slip to a creep-only flow. 06) In certain substantial areas of the Avalon Peninsula, groundwater became confined beneath a layer of frozen bedrock. When this happened in these areas, bedrock disruption could begin. The major areas of bedrock disruption include the southern half of the Isthmus of Avalon and the north-central portion of the Carbonear sub-peninsula. 07) The cold climate of the Younger Dryas period would tend to favor a rebuild of glaciers or the preservation of existing ice cover. However, the subglacial ice plume model depends on the assumption that conditions on the Avalon Peninsula deviated from this expectation. Rather, polar desert conditions arose and snowfall was insufficient to maintain glacial ice thickness. Thus, during the Younger Dryas, downwasting of glaciers on the Avalon proceeded via sublimation, flow (creep) and summer surface melting and runoff. 08) As cold climate conditions drove a freezing front downward, remnant overpressure of groundwater confined in bedrock beneath thinning ice cover caused migration of pressurized groundwater toward the frozen bedrock/glacier interface. For purposes of the present discussion, this remnant overpressure will be termed rebound pressure. 09) Pressurized groundwater penetrated frozen bedrock, traveling initially as supercooled pore water propagating through joints or through linked pores in the bedrock. 10) When pore water encountered a void in bedrock, an existing segregated ice mass, or the base of an overlying glacier, ice segregation commenced or progressed. Ice-segregation pressure amplified the hydraulic pressure (rebound pressure) of the subglacial bedrock aquifer. 11) Segregated ice advanced by creep, shifting bedrock fragments in the process (subglacial bedrock frost heave). Newly created ice, along with entrained bedrock fragments, moved into overlying glacial ice forming a subglacial ice plume. 12) The net motion of ice-entrained bedrock fragments was the vector sum of groundwater-generated plume-ice velocity and the creep velocity of ice in the overlying glacier. Ice and rock velocities could be very low. Bedrock disruption features with meter-scale rock displacements, forming over centuries, would entail tectonic-scale rock-movement velocities. Bedrock disruption was strongly enhanced when creep of an overlying cold-based glacier augmented subglacial bedrock frost-heave action. 13) Persistent polar desert conditions throughout the Younger Dryas cold period led to the downwasting of residual glacial ice on parts of the Avalon Peninsula to zero thickness or to a low-enough thickness that trivial erosion by basal sliding occurred in the lead-up to the Holocene. 14) With the departure of glacial ice, ice-disrupted bedrock fragments sometimes settled into distinctive patterns indicative of their prior transport in a subglacial ice plume. 01) Frost-heaved bedrock monoliths and groups of monoliths. In cases where groundwater propagating through multiple closely-spaced pores or joints approaches the frozen bedrock/glacier interface at a uniform rate over a significant area, the central portion of the resulting plume will be non-diverging. One or more frost-heaved monolith(s) can form in this area. Creep motion in the overlying glacier can tilt (rotate about a horizontal axis) the monoliths or transport them if they become dislodged from the bedrock substrate. In cases where groundwater/segregated-ice propagation is concentrated in a single joint or fissure, a diverging plume will result. Single frost-heave monoliths can develop over a narrow source of upwelling ice, or a diverging group of frost-heave monoliths may develop. 02) Frost-heaved bedrock mounds. When multiple bedrock fragments are displaced together by a subglacial ice plume, the fragments may settle into a disorganized mound after glacial ice departs. The mound may show evidence of shaping by ice flow when significant near-ground tangential ice creep occurs at the location where the mound forms. ​03) Rotated bedrock frost heave. When subglacial bedrock frost heave occurs in an environment where ice creep velocities are higher at one end of a displaced bedrock fragment than at the other end, the fragment can rotate. The most common example of this occurrence is hillside frost wedging (also termed "restricted plucking" in some earlier discussions). Since bedrock is non-plastic under glacial pressures, creep velocity approaches zero at ice-rock contacts. When a bedrock fragment rotates away from host bedrock, the end that moves furthest experiences the most rapid creep in the surrounding ice. Thus, once started, rotation of fragments will often tend to accumulate. Subglacial ice plume action or creep in the overlying glacier can cause rotation of frost-heaved bedrock fragments on sloping surfaces. 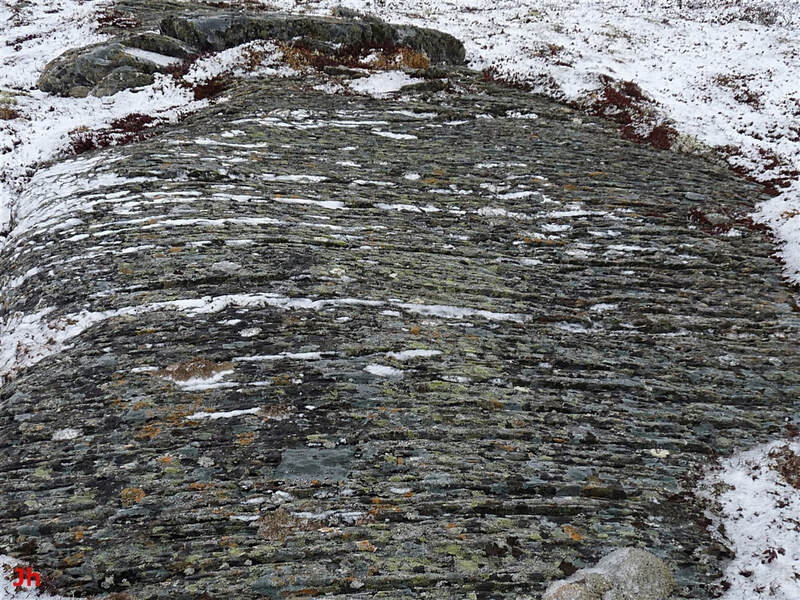 Where bedrock foliation is steeply dipping (the usual instance), rotation typically causes the top of the fragment to rotate away from the hillside, while the bottom remains anchored. Within the subglacial ice plume model, it is important to realize that bedrock displacement involving mainly translation (development of frost-heave monoliths) is little different in principle from bedrock displacement involving mainly rotation (development of features frequently resembling plucking). Often, rotation and translation occur together in single joint blocks or in groups of joint blocks in a common area. 04) Joint widening. If bedrock is tightly confined (thus inhibiting fissure formation) and rock failure does not occur simultaneously along a three dimensional system of intersecting joints (hence blocks or fragments are not released from substrate), the only effect of a subglacial ice plume is to exaggerate foliation in the bedrock by widening joints from molecular dimensions to macro dimensions. Observations suggest that the most common and widespread effect of subglacial ice plumes is joint widening. When pore water reaches the glacial base without macro disruption of bedrock, then presumably ice segregation occurs directly against the base of the overlying glacier. This process comprises non-tangential ice flow and can change glacier creep velocity vectors, particularly in the region near the ice-rock interface. Observational evidence for joint widening is found in accelerated freeze-thaw weathering of joint-widened rock. The accelerated weathering creates a distinct lineated surface appearance which is characteristic of areas where bedrock frost heave is common. Updated interpretation: Observations of grooved erosion patterns such are shown in the above photo are more probably attributable to erosion by ice extrusion than to accelerated freeze-thaw weathering of joint-widened rock. ​05) Fissures. At the narrow tops or edges of hills and ridges, joint widening commonly transitions to systems of fissures. The formation of fissures reflects a lack of confinement of the host bedrock. Ice-induced fissures typically follow longitudinal jointing or cross jointing or both. In many instances, systems of fissures transition to rotated bedrock frost-heave at the edges of down-slopes. 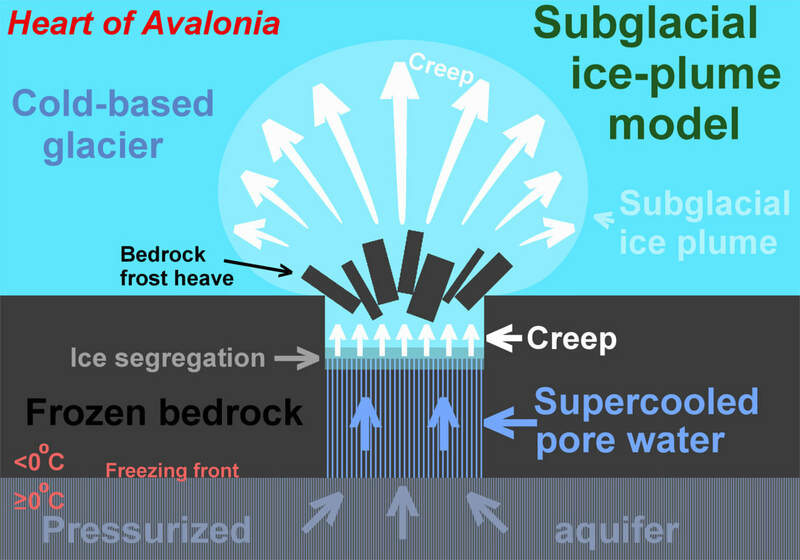 As described above, each category of ice-disrupted bedrock observed within particular areas of the Avalon Peninsula (specifically, those areas where bedrock frost heave monoliths are common) falls within the bounds of the subglacial ice plume model. Observational evidence supporting the model can be found in the Illustrative Features (IF-01 to IF-07) presented to date, although some of this evidence is ambiguous. A major Illustrative Feature (IF-08, Rebound Ridge) will be presented (pending) with the aim of clarifying the ambiguities. Individual observations of ice disrupted bedrock features can be used to place constraints on the above parameters and then to potentially infer the changes in paleoclimate that led to episodes of bedrock frost heave. An example of ice-induced bedrock disruption potentially attributable to subglacial ice plume action is shown below. The above-illustrated layout of ice-disrupted bedrock superficially resembles a glacially plucked area, or an area where the motion of a glacier across the edge of a low bedrock ridge has dislodged fragments and dragged them rightward (direction relative to view seen in photo). For scale, note the hammer (25 cm long) just above and to the right of center in the photo. The superficial explanation for the bedrock disruption appears unlikely after a close examination of the arrangement of the fragments. At the left edge of the disrupted area, joint blocks have been shifted vertically upward (bedrock frost heave), while successive rows of joint blocks have been lifted upward and rotated through increasingly steep angles. The area beneath the blocks is significantly open, implying an intrusion of ice beneath the disrupted assembly. Some blocks have been lifted vertically and then shifted horizontally, now lying on top of blocks that they were once beside. 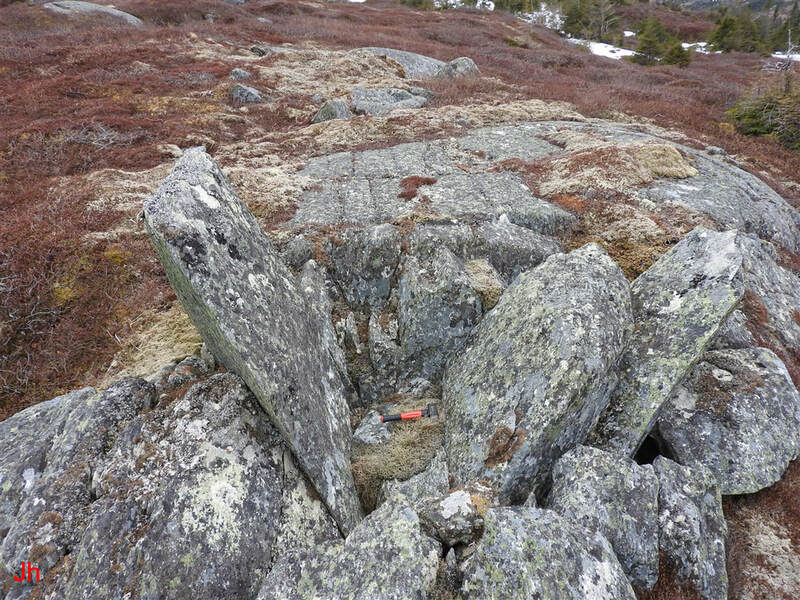 The overall disrupted-bedrock feature was judged to be fragile and vulnerable to significant modification or to collapse in the event that glacial ice were to slide over it. The conclusion, therefore is that the feature shown above is a remnant of a subglacial ice plume and that the overlying cold-based glacier moved only a small amount while the feature was being formed. Movement of the blocks was augmented significantly by ice emerging from bedrock underneath the feature. 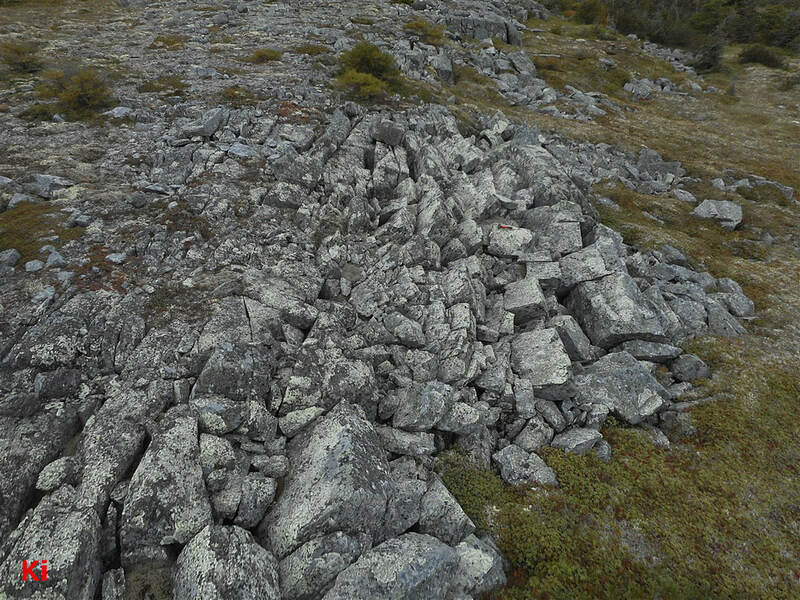 Understanding features like the one shown above will aid in interpreting the diverse ice-disrupted bedrock landforms of the Avalon Peninsula and the climate conditions that led to their formation.